Starting Fresh! 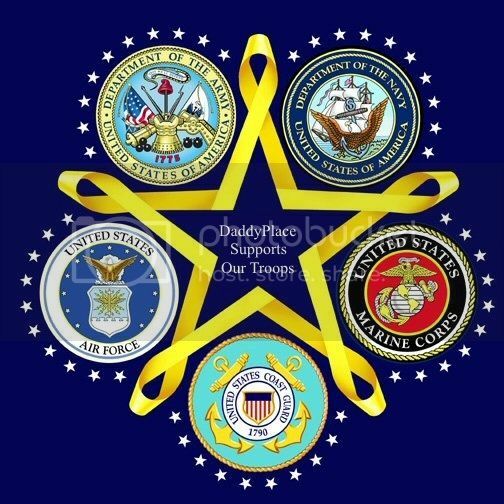 If you are active service, veteran, or retired from the military, post what, when, and where you are or have been HERE. It doesn't matter which branch, or for our international dads which country, just let us know. We support our troops current and past. There probably will be some inter-service razzing here and in this forum, but if your a vet, retired or active you have the thick skin to survive and return fire, except maybe the Air Force guys. For them the scented tissue is on the left next to the Midol. We are all brothers, regardless of which branch. I will start. I am a US Navy Submarine Veteran. I was in the Navy from 1988-1994 and served on the USS Los Angeles SSN-688 fast attack submarine. My Rate was MM2/SS (Machinist Mate Second Class Submarine Warfare Qualified). I completed Naval Nuclear Power School (1988-1990) and was a Nuclear Trained Mechanical Operator. 15 years with the Kentucky Army National Guard. 92A Automated Logistics Specialist the whole time. During this time: I was mobilized to do Gate Guard at Ft. Knox, KY for 6 months; Deployed to Bagram, Afghanistan (12 months, boots on ground); Deployed to Q-West, Iraq (4 months BOG); and finally I've served on three Disaster Relief Missions for KY (Flood, Tornado, and Ice Storm). In addition, I've worked for the KYNG for 13 years as a Military Technician (DOD Employee). Enlisted in the Army straight out of high school in 1997. Came in as a tank driver moving up to gunner and tank commander. In 2005, i went to Officer Candidate School and was commissioned as a 2nd Lieutenant in Armor branch. I am still serving today, and will hit 19 years in the Army in June. I should also be promoted to the rank of Major in May. Last year i switched my branch to Modeling and Simulations - which means that we work on planning simulated training for units to save the Army money. (I switched to try to broaden my resume for when i retire in a few years. I plan to retire at 22 years, so 3 more to go. I have served 2 tours to Iraq and 1 to Kosovo and have been stationed in South Korea, Germany, Fort Knox Kentucky, Fort Richardson Alaska, Fort Bragg NC (twice), and Fort Hood Texas. Additionally i tough ROTC at a small military school in Georgia.